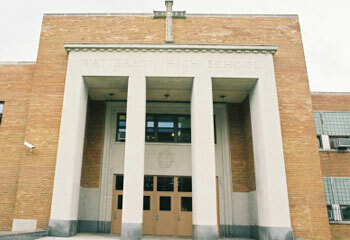 Bishop Watterson High School, Columbus, Ohio. COLUMBUS, Ohio — Students at Bishop Watterson High School in Columbus, Ohio, are fighting for a longtime physical education teacher and coach they say was been fired by the Catholic Diocese of Columbus because she’s gay. Carla Hale is liked and respected by students and colleagues, but people close to her and the school say she was terminated after Bishop Watterson and church officials were told that she included her partner, Julie, in her mother’s newspaper obituary. Students began an online petition on Monday that has been gaining about 100 supporters per hour. It was up to 2,800 by noon today. Garrity said students learned of Hale’s firing this week, although they weren’t told directly by the school. The school didn’t tell faculty either, others said. Two people who know others who’ve spoken to Hale told Outlook the details of her termination. Hale’s mother, Jeanne E. Roe of Powell, passed away on Feb. 25, and her obituary appeared in The Columbus Dispatch the next day. Hale’s partner, Julie, was listed among Roe’s survivors. That is what prompted school officials to fire Hale, the source said. Neither Principal Marian Hutson nor diocese spokesman George Jones have responded to requests for comment. Hale still is listed on Watterson’s website as head of the school’s health and physical education department. It’s the second time this year that Catholic schools in Ohio have fired educators for ties to the LGBT community. In February, Mike Moroski, an assistant principal at Purcell Marian High School in Cincinnati, was fired by the Cincinnati Archiocese after he stated his support for marriage equality on his personal blog. © Outlook Columbus, an LGBTQ Nation media partner.